re Sometimes referred to as Bengali Five Spice, this hearty blend makes up much of West Bengal’s cuisine, giving it its distinct earthy flavor. 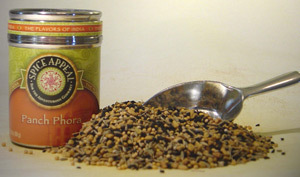 Panch Phoron is also considered to be India’s third most popular blend; after curry and garam masala. This mixture of whole spices is usually fried in oil or ghee at the beginning of cooking. Other ingredients are either then added on top, or this oil and spice combination are then added to potato dishes, lentils, and chutneys. Add to vegetable curries or sprinkle on rice. This whole spice mixture includes cumin seeds, nigella, black mustard seeds, fennel seeds, fenugreek seeds, and other spices.